With their deadly venom and signature noise-making tails, rattlesnakes are some of the most iconic reptiles around. When rattlesnakes are born, they hatch from eggs, but there's more to the story than that -- the way that a rattlesnake hatches from an egg is different from the way, say, a bird does. But, of course, the rattlesnake would never reach that point if his parents hadn't met and mated in the traditional rattlesnake fashion in the first place -- females generally produce offspring every two to five years. 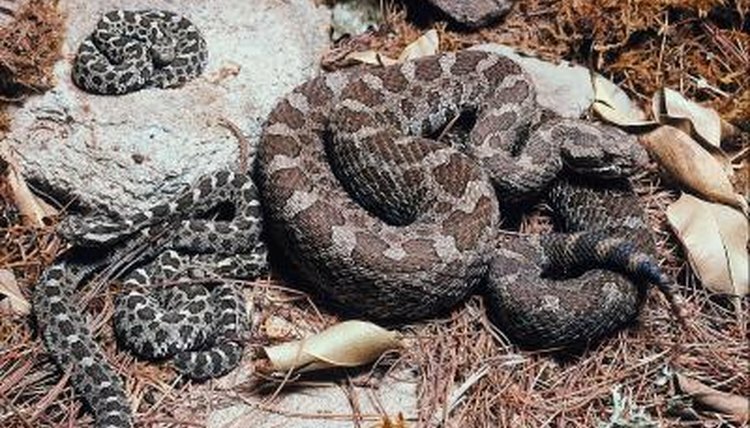 While there are variations between types of rattlesnakes and their geographic areas, in general, rattlesnakes mate during the warmer months, from mid-spring through mid-autumn. During the mating process, a female leaves traces of her scent wherever she goes, and male rattlesnakes use their tongues to follow the trail. When more than one male reaches a female, the two will engage in combat, and to the victor go the spoils: the female's affection. When a rattlesnake is pregnant, she carries eggs, but the eggs don't hatch outside of her body -- they hatch inside. This is because rattlesnakes are ovoviviparous, which is a type of animal that carries eggs inside their body until they hatch. She'll then give birth to live offspring. Rattlesnakes aren't unique in this regard -- other reptiles are also ovoviviparous. The length of the gestation period varies some from breed to breed. In general, a rattlesnake's gestation period lasts about 90 days, but some breeds, like the timber rattlesnake, can be pregnant for longer. In the case of the timber rattler, females may be pregnant for as long as five months. The average brood size is between four and ten baby rattlesnakes, which are born wrapped up in a membrane from which they quickly free themselves. Since they don't hatch outside the body, baby rattlesnakes are generally well-developed and independent when they're born. They are born with only one rattle, but every time they shed their skin, another rattle develops. They'll stay relatively close to their mother until their first shed -- about a week after their birth -- and then they go off on their own. How Do Diamondback Rattlesnakes Care for Their Babies? Do Rattlesnakes Travel in Groups? What Is the Size of a Male and Female Rattlesnake? What are the Two Types of Egg Births in Snakes? How Long Is a Cobra?